Alphege was born in Weston, on the outskirts of Bath. He became a monk early in life, and first entered the monastery of Deerhurst, but then moved to Bath where he became an Anchorite. He was noted for his piety and austerity, and quickly became the Abbott of the Abbey in Bath. In 984 he became the Bishop of Winchester. While Bishop he was largely responsible for the construction of a large organ in the Cathedral, audible for over a mile away and said to require more than 24 men to operate. He also built and enlarged the city’s Churches. In 1006 he became the Archbishop of Canterbury. He went to Rome to get his Pallium from Pope John XVIII, and was robbed during his journey. In 1011, the Danes raided England, and from September 8-29th, they laid siege to Canterbury. Alphege, the Bishop of Canterbury was taken captive for seven months. The Bishop of Rochester and the Abbess of St. Mildrith’s were captured also, but the Abbot of St. Augustine’s Abbey managed to escape. They then set fire to the Canterbury Cathedral and destroyed it. Alphege refused to allow a ransom to be paid for his freedom, and as a result was killed on April 19, 1012 at Greenwich (now a part of London) on the site of St. Alfege’s Church. He was the first Archbishop of Canterbury to die a violent death. Some sources say his death was so violent, that a Christian convert, known as Thrum, delivered the back of an axe to his head as an act of kindness. He was buried in St. Paul’s Cathedral, and later his body was moved to Canterbury. After his death, many conversions came about with the soldiers who carried out his gruesome death. 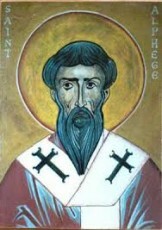 St. Alphege was born in 954, in Weston. He became a monk early on in life, and was very spiritual. He became the Bishop of Winchester, and then the Archbishop of Canterbury. He was noted for building many of the city’s Churches, or expanding the ones they had. In 1011, the Danes raided England, and he was captured for a period of seven months. He refused to have a ransom paid for his release, and was ultimately tortured and killed. He is a martyr for the faith, and his feast day is April 19th.